A collaborative study from [email protected] Delhi and National Institute of Advanced Industrial Science and Technology (AIST), Japan has been published in the Journal of Experimental and Clinical Cancer Research (JECCR). Cancer is a complex disease, largely defined as abnormal growth of cells. Whereas our normal cells divide for limited number of times, cancer cells keep dividing autonomously and develop into unwanted mass of cells anywhere in the body or even acquire the capacity to migrate to secondary sites. According to the World Health Organisation, cancer is one of the top causes of death globally. Surgery, radiotherapy and chemotherapy are the current mainstays of cancer treatment and are complicated by severe toxicity, undesirable secondary effects on the normal body functions and most seriously the treatment failures. Hence, a lot of research worldwide is focusing on developing NEW (Natural Efficient and Welfare) anticancer drugs. DBT (Department of Biotechnology) – AIST (National Institute of Advanced Industrial Science and Technology) International Laboratory for Advanced Biomedicine, [email protected] (India) and [email protected] (Japan) report their research results on Ashwagandha (Withania somnifera, a popular herb in Ayurveda, the traditional home medicine native to India) that has recently been brought into limelight by findings from these groups. 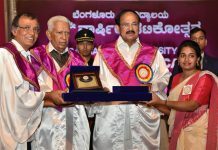 (http://web.iitd.ac.in/~sundar/dailab/). Tumor suppressor p53 protein, also known as guardian of the genome, is frequently mutated in a large majority of cancers. These mutations induce local or global changes in protein structure thereby affecting its binding to DNA. 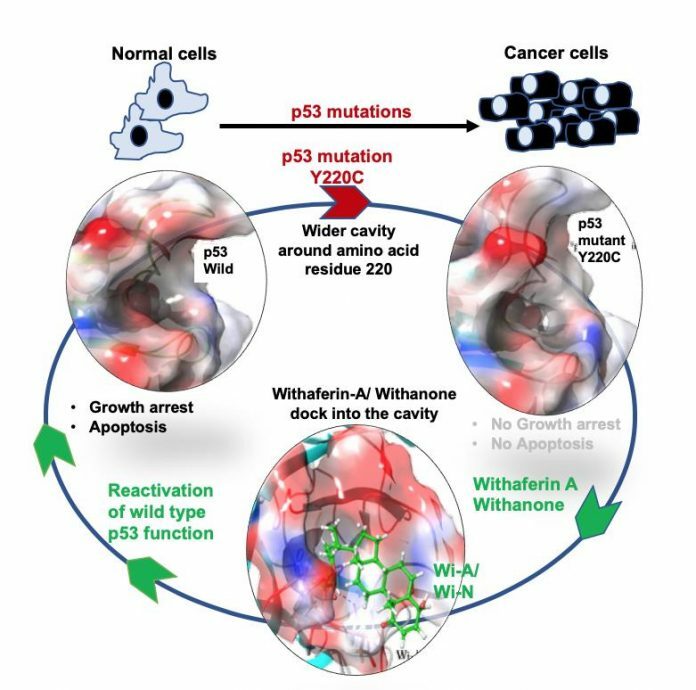 The structural differences between the wild type and mutant p53 provide an opportunity to selectively target mutated p53 harboring cancer cells for cancer therapy. Restoration of wild type activity in p53 mutants using small molecules that can revert the structural changes have been considered promising strategy for drug development. [email protected] Delhi and [email protected] carried out bioinformatics and experimental studies to (i) investigate the structural changes between the wild type and four commonly found mutant p53 (p53V143A, p53R249S, p53R273H and p53Y220C) proteins and (ii) explore the therapeutic potential of Ashwagandha withanolides, Withaferin A and Withanone, for restoration of wild type p53 function in cancer cells. They found that p53Y220C mutation causes conformational change leading to functionally inactive form. And, the mutated form could accommodate withanolides suggesting their conformational selectivity to target p53Y220C mutant. Using human cell lines containing specific p53 mutant proteins, they demonstrate that Withaferin A, Withanone and the Ashwagandha leaf extract rich in these withanolides indeed caused restoration of wild-type p53 function in mutant p53Y220C cells that was well associated with induction of growth arrest/apoptosis. p53Y220C mutation has been categorized as the 9th most frequent p53 missense mutation found in cancer with ~100,000 new cancer cases per year worldwide and is one of the major mutations in Aflatoxin B1-related hepatocellular carcinoma and head & neck squamous cell carcinoma. They provide the first line of evidence that Withaferin-A and Withanone may be particularly effective for treatment of cancers with p53Y220C mutation. 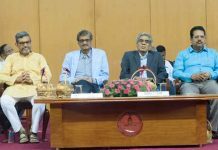 Dr. D. Sundar, Coordinator of [email protected] Delhi, and Professor at the Department of Biochemical Engineering and Biotechnology, commented that they could not accomplish these findings without the effective collaborations with Drs. Sunil Kaul and Renu Wadhwa, AIST (Tsukuba, Japan) and Evangelos Kolettas, Biomedical Research Division, Institute of Molecular Biology and Biotechnology, Foundation for Research and Technology, Ioannina (Greece). He believes that the basic research using advanced molecular biology tools is an extremely important and essential step to promote NEW drug development. 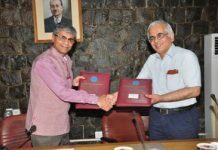 IIT Delhi encourages such multidisciplinary and international research efforts, and has set up several such collaborations to facilitate multiple module basic/applied research and technology development. The collaboration between IIT Delhi and AIST has its origin in the year 2010 and has been highly successful so far. The highlight of this collaboration has been the integration of complementary research expertise available between the two groups. 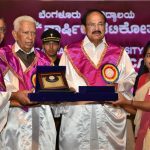 Both the Institutions have drawn strength from their past accomplishments in the molecular analysis using bioinformatics and biochemical approaches as well as recent developments in molecular sciences.